This article describes what you need to know about getting tickets for the Rose Bowl football game. It's a practical guide created just to help you get those hard-to-find tickets. The annual Rose Bowl Game happens at Rose Bowl Stadium in Pasadena, California. The participating teams are the champions of the Pac-12 and Big Ten Conferences. That is unless one of those conference champions goes to the College Football Playoff Semifinal. In that case, the next best team in the conference replaces them. No one knows which teams will be playing when the game tickets go on sale. But that doesn't keep people from buying them all, seemingly within seconds after sales open. It's always hard to find Rose Bowl tickets no matter what, but don't give up hope. If you're prepared, persistent and lucky, you might even be able to get those coveted tickets at face value. Failing that, if you're willing to pay whatever it takes to get Rose Bowl tickets, you can get them for sure. Here's what you'll need to do to get your Rose Bowl tickets. The first way to try getting tickets for the Tournament of Roses is to buy them directly, but it's not easy. In fact, Rose Bowl tickets have sold out every year since 1947, usually long before game day. Many tickets are held to sell to supporters of the teams that will play, but a limited number of them go on sale to the general public in December. The chances of getting one those few Rose Bowl tickets at face value are slim. But it doesn't cost you anything to try. If you have the time, try this approach first. 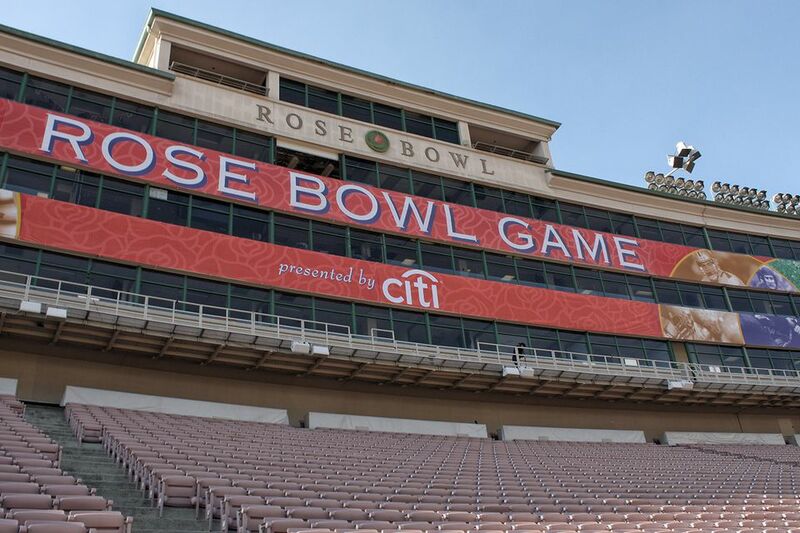 Use the Tournament of Roses Official Website which tells you everything you need to know to get Rose Bowl tickets through them. You can get two tickets per order and make a maximum of two orders per person. You'll have the best chance of getting your Rose Bowl tickets if you try to buy them using the steps described below. Ask a friend or two to try at the same time, which will increase your chances of getting something. If you end up with too many tickets, you can always resell them. Know what to do before the Rose Bowl tickets go on sale in early December. You can get the exact date and time to purchase tickets from the Tournament of Roses website, but the tickets are actually sold through Ticketmaster. Tickets cost hundreds of dollars each. Prices can be even higher if in-demand teams are expected to be playing. Get familiar with the Rose Bowl Stadium layout. Even a slight hesitation while trying to decide where to sit could be the difference between getting a seat and missing out. Check the Rose Bowl seating information on their website. Get a Ticketmaster account. Log onto Ticketmaster a few minutes before the release time. Have your credit card ready. Start trying to reserve the instant tickets become available. At the same time, start calling Ticketmaster at 1-800-745-3000. Keep calling until you're connected. Keep trying both methods until you succeed or they are sold out. If you missed the Rose Bowl tickets release date — or tried and failed to get Rose Bowl tickets that day, don't despair. Rose Bowl tickets will still be available through brokers who buy and resell them at a profit. In fact, the broker's prices can be three times what the face value is — or more. It's a practice that may be aggravating but is entirely legal. Through a broker, you can also get tickets for groups up to 10 or 20, with seats guaranteed to be side-by-side or "piggy-backed" one row behind the other. You can try PrimeSport which is the official Rose Bowl ticket reseller. They aren't the only brokers that will have them, though. You find can brokers with Rose Bowl tickets for sale by searching online for "rose bowl ticket broker." Ticket broker prices sometimes start out higher but go down after an initial spike. In some years, they have dropped more than 40% during the first two weeks after they went on sale. The longer you wait, the lower the price may fall, but you risk them selling out.